Stop Reinventing the Wheel. Follow these 5 Steps to Build a Well-Maintained Proposal Content Library. In previous blogs, we’ve touted the importance of establishing tools and systems, including a must-have Proposal Content Library, to help your proposal department run more efficiently. But proposal departments are consistently busy. How do we find time to stay organized? While it may be challenging, especially with an overload of concurrent deadlines and multiple 500-hour proposals, spending one to two hours now will save significant time and resources in the future. 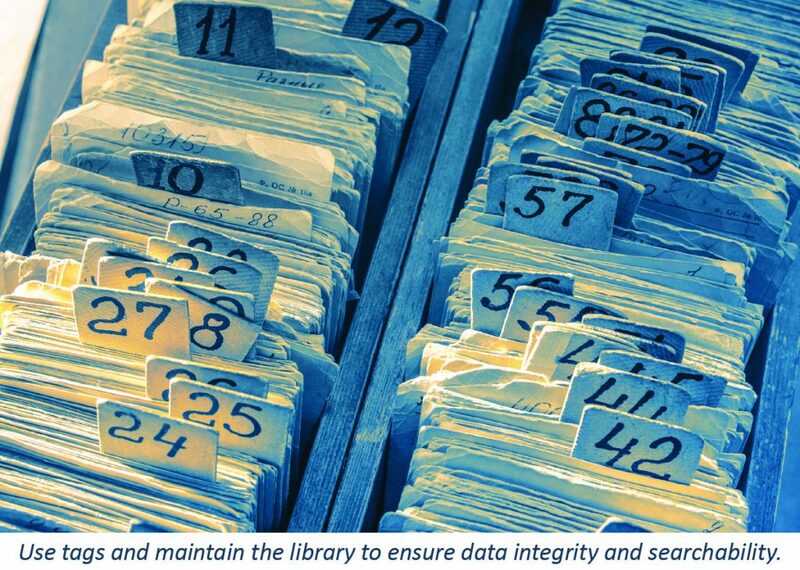 Avoid spending hours searching hundreds of files and parsing through old information. You want to maximize efficiency with previously created organizational charts, project descriptions, resumes, and management plan narratives. But you also want to avoid spending hours searching hundreds of files and parsing through old information. How do you make sure that the new content developed or data collected is not only fully captured in the centralized proposal repository, but is also readily available for future proposal teams to use? Follow these tips to build, update, and maintain your collection. 1. Develop a system to track the items that need to be filed post proposal completion. Often during the proposal process, we learn of new data that should be captured in the library, but we’re in the middle of fast approaching proposal deadlines. Key data to capture could include updated project completion dates, self-performance percentages and scope, past performance ratings, new strategic or tailored content, or customer hot buttons. One solution is to save documents and notes in a shared folder titled “File Me”. Once the proposal has been submitted, we go through the documents and notes, and log the data or save the narratives in the content library. The goal is to ensure valuable information gets filed and that it is well organized and easy to locate for future use. 2. Assign Accountability and Apply Deadlines for Cataloguing and Archiving in the Proposal Closeout Process. An important part of our process is the assignment of accountability for collecting and curating content and data. The assigned Proposal Lead is the best person to fill this role and ensure that all new data is filed and old data is appropriately archived. Establishing this process and accountability as a standard part of the proposal process ensures the library’s growth into an invaluable resource for the proposal team. Following proposal turnover, the Proposal Lead takes time to break down the proposal components and catalogue each written piece and graphic in the appropriate folder in the content repository, depending on whether it is related to Resumes, Project Descriptions, Quality Control, Time and Cost Controls, Design-Build Coordination, Healthcare Construction, etc. Outdated versions of the newly updated content should be archived. Keep the folder structure clean and organized to allow easy navigation. TIP: to ensure accurate and timely update of the content collection. 3. Improve the Searchability of Content. Take advantage of tags to aid in the retrieval of previously developed proposal components. List the tags at the beginning of the document. Include a brief description of the customer, the proposal it came from, and how and in which proposal section to use the content. Most companies can benefit from a cloud-based library versus an expensive software. As the proposal team members experience the ease in finding what they need, they become more confident in the centralized data and increase their use and efficiencies. TIP: Update the brief description in the content file if you learn from a debriefing that the content was rated “Excellent”, etc. to help writers easily identify quality material. Archive those that were rated unfavorably or that are outdated. Often overlooked is the communication of the updates to the proposal department. It is good practice to send out an email to the team with a list of the updates and additions made, or share them in department meetings. 5. Perform Regular Routine Maintenance and Assign a “Champion” to the Overall Process. Routine maintenance of the library is critical for its health. Keep the library clean, up-to-date, and well-organized to prevent a decline in its effectiveness and function. Review the folder structure. Ensure file names conform to naming conventions and that there are no misspellings. Are files in the correct folders? Archive old versions. This optimizes the library and allows the most clear, accurate, and useful content to be at the disposal of the proposal team. Assign a champion to the process to ensure performance of routine maintenance and timely archiving by the Proposal Lead or other assigned person. Most likely, the champion of the process will be a senior manager or the person overseeing the proposal department. A compelling proposal requires a tailored approach. Keep in mind that while standardized content helps with automating the first draft, a compelling proposal requires a tailored approach. You must consider the RFP submission requirements and evaluation criteria. It’s also imperative to understand the customers’ needs and tailor the response to explain how your solution will solve their problems. The “cut and paste” method is not the winning approach in today’s “best-value” procurement arena. A well-maintained library empowers the proposal team with streamlined knowledge sharing, efficient search capability, and instant access to a large amount of content resources. 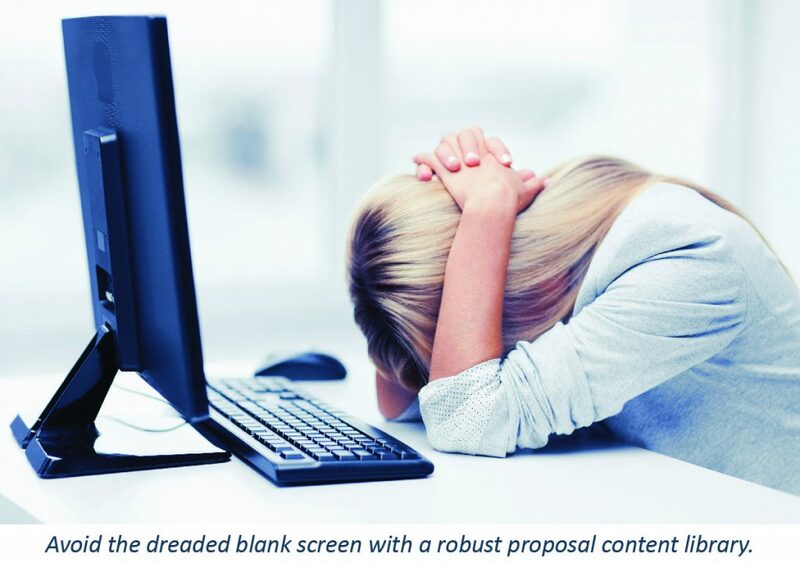 We all dread sitting down to stare at a blank Word document. Having a starting point can greatly save time with that initial draft, so that you can focus on developing winning differentiators and strategies. For more information on how to set up and make the most out of your database, please contact us at www.strategiccreations.com/contact. Oh, the Places You’ll Go! Strategic Creations celebrates 5 years of helping businesses succeed.